As a twenty-one-year-old first-year teacher, I worked harder than I had ever worked before. I arrived at school early in the morning, sometimes before the custodian had even turned off the alarm system. Who could forget that cold February morning when the police came into the building looking for an intruder, but instead found me grading and sorting papers at my desk? Throughout the day, I taught my lessons, tutored my students, and stayed long after most of the veteran teachers had gone home. Each night, I would take piles of papers home to grade, and spent hours planning the next day’s lesson. My first few years of teaching included many amazing lesson plans. I say that in jest, because a typical day in my classroom mostly involved notes on the chalkboard (yes, the chalkboard! ), which went along with a twenty- to thirty-minute lecture. At some point, I graduated to the more sophisticated transparency on the over-head projector. Typically, a blurry worksheet from the textbook teacher’s guide would follow to reinforce the lesson objectives. Occasionally, I would even use the one teacher computer in the workroom to create my own materials. Few teachers even attempted to use it at the time, so it was frequently available. For homework, students would then be assigned to write a paragraph summarizing the lesson’s objective. Their compositions basically spit back the notes I had scribbled in chalk dust. My units concluded every two weeks or so with an old-fashioned recall test, which I spent hours grading and analyzing by hand. At the start of my third year of teaching, my school finally began to purchase some instructional technology. A few times a year, I was able to check out a digital projector and a “state-of-the-art” interactive whiteboard from the media specialist. I can still remember wheeling the rusty cart with the one staff desktop computer down to my classroom. From there, I had to push the giant, cumbersome interactive whiteboard with the tiniest wheels down to my room as well. Everything was connected by a web of wires that I feared students would accidentally trip on coming into the classroom. Once I had set everything up, I was ready to teach what I thought was my most amazing lesson ever taught! It included a PowerPoint presentation I had created, which had pictures and animations. Even if I was able to work out the technical glitches—like the flashing light on the serial port that would not stop blinking—I was basically using it as a screen with a fancy mouse to advance the slides. My principal at the time observed my lesson and had nothing but praise for how well it went. In the weeks that followed, I began to create more of these lessons. I was even inspired to build a simple website, where I began posting notes and a list of assignments for students and parents, even though most of them did not yet have Internet access. In those early years, I felt like I was doing a great job in the classroom—perhaps I was for the time. I was working very hard in my students’ best interest and using all of the resources, including technology, that were available to me. I often received praise from my administrators and parents for my efforts. I even won several awards! However, looking back and reflecting on those early years, I realize my lessons lacked the use of “effective instructional technology.” My lessons were also typically low-level, one-size-fits-all, drill-and-kill endeavors that failed to challenge my students to discover new knowledge, collaborate with one another, interact with content, or create their own work products. Today, all of that has changed. Over the years, I have become a much different and—dare I say—much better teacher! My classroom has evolved into a “paperless” student-centered, technology-based learning experience. Students are able to work on technology-based differentiated lessons at their own pace. Each of these lessons challenges students to discover new information for themselves, interact with the content, and create their own multimedia work to showcase what they have learned. Learning thrives in my classroom by providing students with opportunities to collaborate, create, and share what they have learned with others. Today’s students have grown up with technology and are able to use it more successfully than many traditional classroom resources. A typical lesson in my classroom today begins with students logging onto my website. My classroom website has grown over the years from a way to post information into an interactive learning community. From my website, students can access every lesson and activity online, both inside and outside of my classroom. This provides many opportunities to flip my classroom instruction with ease. Students enjoy working at their own pace on activities and quickly become comfortable with our classroom procedures. When students arrive in my classroom, they typically begin working even before I go over the daily directions. I recently had to attend to an altercation in the hallway and was worried about the students who were in my classroom. When I returned, I found my students working diligently and engaged in the daily lesson! Each one of my web-based lessons is based on a carefully composed learning target written to challenge students to use high-level skills and technology to increase their depth of knowledge. For example, a learning target might say something like: “I can predict the challenges George Washington faced as the first President of the United States.” The learning target requires students to go beyond simple recall in order to complete the assignment. Students then go through the lesson directions found on my website—they are able to utilize links to additional materials and explore embedded multimedia to gather the information needed to reach the learning target. Each student is assigned a differentiated lesson based on his or her aptitude and previous performance. As students complete the assignment, they create their own multimedia digital notebook. Being able to create their own digital binder to showcase their work forces students to retain a greater depth of knowledge. It also frees students to work within their own strengths, rather than predetermined pathways. Students are then able to share their work with other students in the class. Throughout the process, teachers and parents can monitor student progress at any time. They can also add scaffolding and support to assignments for students with special needs. My current classroom also includes collaboration spaces in which students work together to complete additional material. Students engage in interactive lessons using my interactive whiteboard and touch table. I am also able to push out engaging collaborative activities to students’ mobile devices from my classroom computer. Assignments such as these give me the opportunity to get every student involved in content reinforcement and constant assessment. My classroom setup also allows me to place my students in the center of a dynamic learning environment created to meet each of their specific needs. While in the past I would have spent hours grading such assignments, my software allows me to gather real-time data on student performance during activities and assessments. Rather than spending time “grading” papers, I can now use that time to analyze items of difficulty, create follow-up activities for at-risk students, and contact parents. 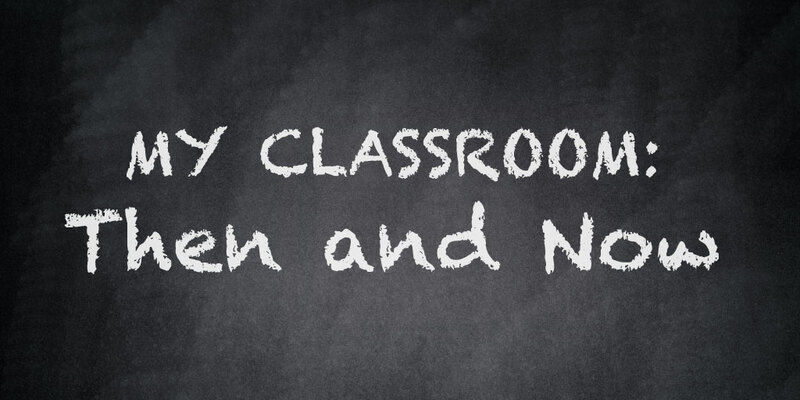 Over the past twenty years, many things in my classroom have changed. The infusion of instructional technology has made my teaching more engaging, effective, and dynamic. As the years pass, educators must continue to evolve in order the meet the changing academic needs of our students and our society. I look forward to seeing what the next twenty years will bring to education—and how I will adapt to become an even better teacher!